Aulistar Mark is not a benevolent dictator; he has a habit of "making people disappear, if they say something that isn't pleasing to my ears." That, folks, is a banhammer. 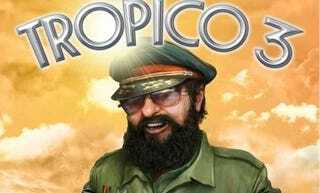 Good thing he's the intern, and only playing Tropico 3. Three of our best and brightest are in Cologne for Gamescom 2010, but KTR still spared two more stateside this morning for a discussion of all things games. Today's Kotaku Talk Radio podcast is live and available for download from your favorite service - Zune, iTunes, or our partners from CBS radio. Mark and host Stephen Totilo discuss the latest Gamescom news, Richard Garriott's space adventures and, of course, Tropico. I rant about motion control. It's great fun, check it out.